RRB JE 2019 Syllabus PDF:- Hello Applicants, The Railway Recruitment Boards has been release the RRB Junior Engineer Syllabus 2019 in Hindi. If you are searching the RRB JE Exam Syllabus in Hindi PDF, Then you are on right portal. We have provide the Railway JE 2019 Exam Pattern PDF also. So you can check the complete info on this page. The Railway Recruitment Boards has upload the RRB JE 2019 Syllabus PDF for the applicants. 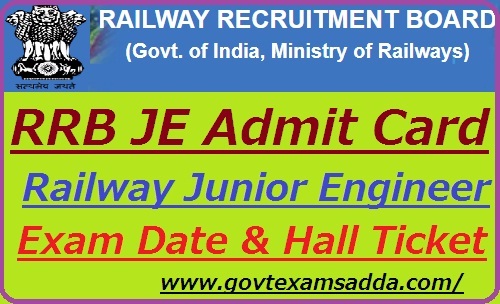 Aspirants who have applied the Railway Junior Engineer Vacancy Form can access the RRB Junior Engineer Syllabus 2019 in Hindi PDF. Candidates can check the Railway JE 2019 Written Exam Syllabus on this page. The Railway announce notification for the requirement of Junior Engineer. Now the applicants are busy in the preparation of examination. They are required the RRB JE Exam Pattern with Subject Wise for the Exam preparation. In the below page, We have provide the Railway Junior Engineer Syllabus PDF. So applicants can check & access this. For more details check the official site also. The Railway syllabus help you in knowing the complete topics detail that are asked in the JE examination. Not only the RRB JE Syllabus in Hindi PDF but knowing the Exam pattern also compulsory to attempt the exam. The Exam pattern has the various Question paper structure. So, Contenders of RRB JE 2019 Recruitment need to follow the latest RRB Junior Engineer 2019 Exam Pattern for the online exam. RRB Jr Engineer Exam Conduct for 200 marks with 200 Questions. Exam duration of the RRB Junior Engineer will be 2 hrs. 60 Questions will be from General Awareness, Arithmetic, General Intelligence and Reasoning. Indian History, Indian Polity, Current Events, Geography, Economy etc. Focus will be on Current national & International events, banking, sports etc. Some questions from Finance & Marketing can be ask in the exam. Focus will be on News related to Railway, Rail Budget, New Technologies & Reform in Indian Railway. Basic Concept of Science (Class 12th standard), Questions will be ask from Daily use science. Physics, Chemistry, Biology & Zoology. Questions will be asked from the Subject/ Trade/ Branch select by candidate. For Section Engineer Some Mathematics questions from topics Laplace Transformation, Matrices, Basic Linear Algebra will be asked. MS Office; Computer fundamentals & organization; C , C++ & Java language; Information systems; DBMS; System programming; Operating systems; UNIX; SAD; Data & Network communication; Web technology & programming; Software Engineering; Environment & Pollution Control. Candidates who are willing to prepare for the written exam and searching the best ideas can see here. We are giving the outstanding Preparation Tips for Railway Junior Engineer Exam for the guidance of applicants. Contenders are suggested to refer only official Railway JE Exam Pattern 2019, Because the Railway Recruitment Board prepare the written exam paper from the RRB Junior Engineer Syllabus 2019 only. If you have any query than comment us.